All-new Mazda2 is a tremendous Super-mini that you can love with your head and your heart, sometimes the best things come in small packages. Full of energy, character and vitality, the All New Mazda2 has been completely redesigned to fall perfectly in line with all of the other Mazda Models using KODO – Soul of Motion design that gives it striking standout presence to keep turning heads. Delivering a sporty interior with cleverly coordinated high quality materials from piano black, high gloss and carbon-fibre effect finishes to satin chrome accents and contrast stitching it’s a car you will want to spend time in. All of your entertainment controls are easily accessed through a 7” touch screen and rotary wheel. This accesses your Mazda MZD Connect Infotainment system logic, elegantly laid out and easy to use it is unrivalled in its class. Available in either a 3-door or 5-door and in petrol and diesel variants, drivers can choose from SE, SE-L, SE-L Nav, Sport and Sport Nav models so there is a perfect All-new Mazda2 to suit everyone. 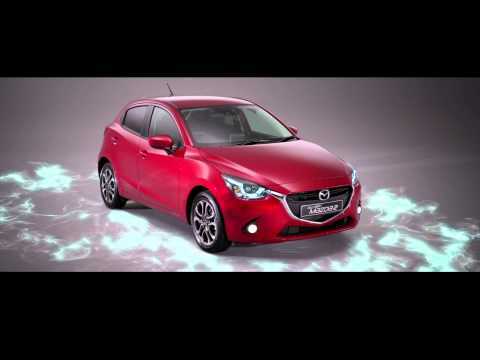 The Mazda2 Sport Black is also available which features subtle styling enhancements. This model comes with brilliant black Airdam front and side skirts, rear spoiler to provide a twist to the already perfect KODO design. The Snowflake White pearlescent and Soul Red Metallic finish the contrast of beautifully with a the opportunity to customise it by adding race graphics and mirror covers to finish off this sporty, striking supermini. With a roadster sharp gear change the alternative engineering pays dividends keeping the weight of the Mazda2 under the tonne mark. This makes for great agile handling and keeps the performance remarkably zesty. The all-new Mazda2 features the innovative, award-winning SKYACTIV technology, which delivers a combination of dynamic driving and handling, while boasting excellent fuel economy and low CO2 emissions. Mazda2 105ps Diesel models deliver a fuel sipping combined figure of 83.1mpg and CO2 emissions of just 89g/km, putting it in VED band A ensuring customers pay £0 road tax, offering great value for money.